Home › History › The Pinfold – A Movable Beast! The Pinfold – A Movable Beast! The modern ‘pinfold’ was built on the site of an earlier structure which was demolished in 1968. But before this, in 1829, a new pinfold was built across the road. Two years ago, when I wrote a history of the Bishopthorpe pinfold for the Millennium Trust, there was one thing that puzzled me: Was the pinfold always in the same place? 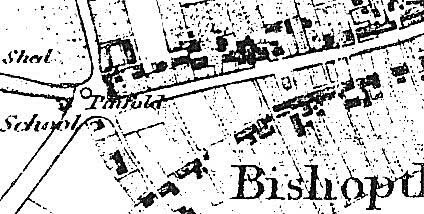 Bishopthorpe was first surveyed by the Ordnance Survey in 1846 and the resulting map published five years later. On that map, the pinfold is shown near to the entrance to Copmanthorpe Lane. The OS re-surveyed the village in 1891 and this revealed the pinfold tucked into the end of a field – i.e. where the modern, lottery-funded structure is now situated, between Appleton Road and Copmanthorpe Lane. 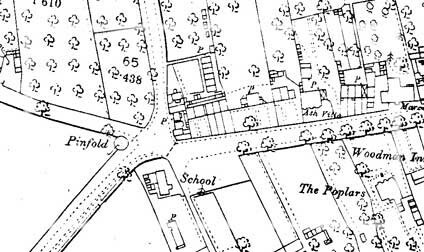 The 1846 OS Map showing the pinfold built outside Ann Challenger’s orchard in 1829 (where the Methodist Church is now situated). The position of the pinfold surveyed in 1891. This one probably replaced the pinfold (seen above in 1846) that Archbishop Thomson demolished in 1865. At first, I questioned the accuracy of the 1846 survey, but the position of the pinfold at that time was corroborated by another plan produced in the same year by the proposed London & York Railway. I was mystified – why would it be necessary to demolish a brick pinfold and rebuild it a few metres away? I had no answer, but unexpectedly discovered some further information. Last summer, while researching the Bishopthorpe Manor Court Minute Book, I found that the pinfold had, indeed, been rebuilt in a different position. At a court dated 26 October 1829, an item caught my eye: A “new” pinfold was erected in front of Ann Challenger’s orchard – but it was there “under sufferance”. The overseer had to pay her two pence per annum as “an acknowledgement that it is to be removed when she may require”. The orchard in question was the long field in which the Methodist Church and the semi-detached houses in Sim Balk Lane are now situated. Whether Mrs. Challenger ever requested the pinfold to be removed is not recorded, but one was taken down some years later by the Lord of the Manor, Archbishop Thomson. However, Dr. Thomson’s “appropriation” of the site of the pinfold for his private use was met with some indignation. At the manor court leet held on the 28 October 1865, twelve local jurymen told the Archbishop’s steward that “great public inconvenience” had been experienced by the removal of the pinfold. After all, where would the pinder enclose straying animals that caused a nuisance? The jurymen trusted that the Lord of the Manor would “obviate such inconvenience in future by causing another Pinfold to be erected in some convenient place within the Manor”. It can only be presumed from these two entries – for there are no others concerning the pinfold – that the pound which Archbishop Thomson pulled down was the one situated outside Ann Challenger’s orchard. Unfortunately, it is not known why the Archbishop should have removed such a useful structure at the cost of upsetting the Bishopthorpe householders. Eventually, another pinfold was built and it is likely to be the same one that appears on the 1891 survey. This pinfold remained in situ until 1968 when the Parish Council deemed it an “eyesore” and had it demolished. 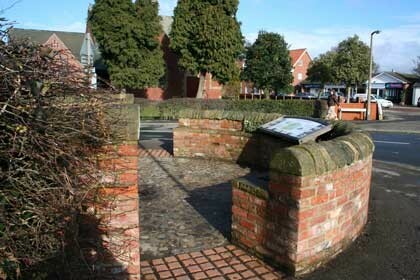 In 2007, the base of this pinfold was unearthed and the new, lottery-funded structure was built within its foundations. Bricks made in the eighteenth and nineteenth centuries were discovered. The earlier bricks suggest that they were re-cycled from a similar structure built some time before 1829; but where that was situated is anyone’s guess. York Reference Library: Ordnance Survey Maps published 1851, 1893. Borthwick Institute: Manor of Bishopthorpe: CCAb 12/Bis: Minute Book, 1829 – 1911. York City Archives: (Railway Deposited Plans) DP 2/31, Part 3, Sheet 93; DP 2/33a, Book of Reference, Part 3: Bawtry to York. Most interesting article Linda. The pre-1968 Pinfold was a favourite place for sitting and watching the traffic both motorized and foot in the “five road ends” area of the village. It, being a little taller than the current pinfold appears to be, afforded a little shelter from the wind which was often welcome. You mention the term “Pinder” do you have any information on this post, who held it and the last time it was occupied? Hello Jean – Thanks very much for your comments. Regarding the pinder – this was an official position held by a tenant of a manor. He was the keeper of the manorial pound or pinfold where straying animals were held until a fine was paid for their release. The tenants were obliged to carry out a number of unpaid duties for the lord of the manor. Other official positions were the constable and affeerer (he assessed the amount of a fine). These officials were elected annually at a manor court. Having said that, some villagers continued in the post for several years. They were substitutes for the men who were officially elected, and were usually paid a small sum by those men in return for carrying out their duty. The Bishopthorpe Manor Court Minute Book mentioned in the sources above, lists the officials. For example, in the 1860s, Edward Hutton continued to be recorded as the pinder for some years. It is interesting to note that Mr. Geoff Dixon (born in the village in 1914) was told by his great aunts that Mary Hutton was the last ‘key holder’ of the pinfold. Mary’s father was Edward Hutton. How long she continued to act in this capacity is not known; she died in 1926 aged 82. If the 20th century seems rather late to need the services of a pinder, then remember that many villagers kept pigs in piggeries in their back gardens. An escaped pig was a nuisance to all. If you wish to read more about the history of the pinfold, see the Archive section. Mr. Woodburn who was the village postmaster kept a “Back Garden Pig” and I would guess that this was as late as the 1960s. We helped to feed the pig(s). Bill Gatenby would come around on Sunday morning and empty the “pig bin” from our back garden where my parents had dutifully placed all the scrap food and peelings for the week. Bill had been the village policeman I believe and in retirement this was one of his little jobs. What Bill got from the deal I don’t know, but we received a bag of Terry’s mishapes (reject chocolates) each Christmas. ← Fresh Air and Fun!